1. Put mince and prawn in a medium bowl and stir to combine. Add water chestnut, ginger, shallot, oyster sauce, sesame oil, soy sauce and mushroom. Stir well. 2. Lay 4 of the gow gee wrappers on a clean, dry surface. Wet 1 side of each with a little water. Put 1 tsp of the filling in center of each wrapper, then fold edges together and press into pleats to seal. Repeat to make 48 dumplings. 3. 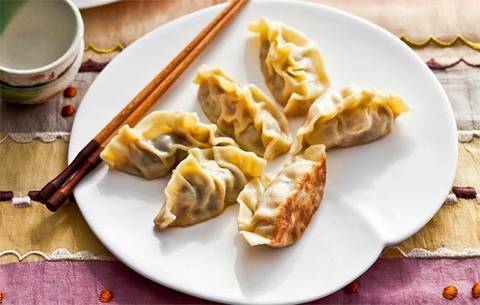 Put dumplings on a tray and keep, covered, in the fridge until ready to cook (put any leftover wrappers in freezer for later use). 4. Heat 60ml of the oil in a large non-stick frying pan over a medium-high heat. Add about 12 of the dumplings, pleat-side up, and cook for 2-4 minutes or until deep-golden on bottom. Pour in 300ml of the water and cover pan with a tight-fitting lid. Cook for 5-6 minutes or until water has evaporated. Repeat, in batches, to cook remaining dumplings. 5. Meanwhile, to make dipping sauce, combine all ingredients in a small bowl. 6. Serve dumplings immediately with dipping sauce on the side.